Lord Ice Man is the frozen products brand that have AGROFRIO. Lord Fresh Man is the fresh products brand that have AGROFRIO. Cook from frozen. Place in boiling water, lightly salted. Bring back to a boil and simmer for 4 a 8 minutes. Drain well and serve. Place in an appropiate bowl, add some water and cover. Cook for 3 to 7 minutes at top high power level. Drain well and serve. Cook from frozen. Put oil on a frying pan. Add the mix, cook for 10 minutes. In a -18°C freezer: up to 24 months. In a refrigerator: 24 hours. Cook from frozen. Fry small amounts of frozen potatoes in hot oil (180°C) for 4 to 6 minutes.Drain well and serve. Place the product in a preheated oven at 225°C. Bake for 15 minutes. Cook from frozen. Place in an appropiate bowl, add some water and cover. Cook for 3 to 7 minutes at top high power level. Drain well and serve. Cook from frozen. Fry small quantities of champignons in hot oil (180°C) for 5 to 7 minutes. Drain well and serve. Cook from frozen. Place in boiling water, lightly salted. Bring back to a boil and simmer for 6 to 8 minutes. Drain well and serve. Place in an appropiate bowl, add some water and cover. Cook for 4 to 6 minutes at top high power level. Drain well and serve. Cook from frozen. Place in an appropiate bowl, add some water and cover. Cook for 4 to 6 minutes at top high power level. Drain well and serve. Cook from frozen. 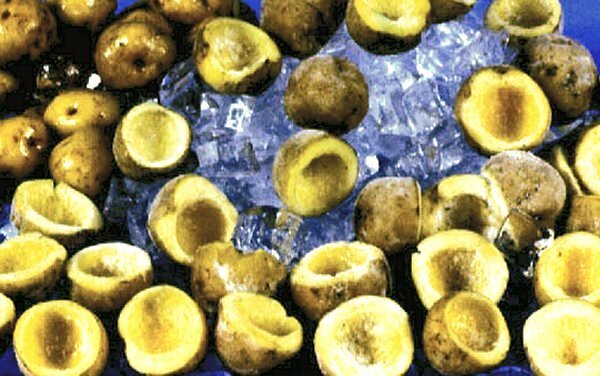 Fry small amounts of frozen potatoes in hot oil (180°C) for 4 to 6 minutes. Drain well and serve. Cook from frozen. Fry small amounts of frozen yuca in hot oil (180°C) for 5 a 7 minutes.Drain well and serve.